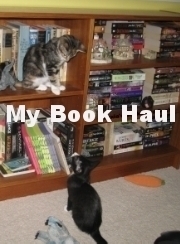 In need of a new way to showcase titles, I decided that My Book Haul seems like a good fit. I like giving books a little special attention as sometimes it can be awhile before I'm able to review them. Sad to say, but some get put on the shelf and gather a little dust before I'm able to give them the love they deserve. I've included links to Goodreads if you want more information on the books. My friend Tammy over at Bo's Book Nook sent me a boxful of awesome! She picked up a few books for me at BEA this year since I wasn't able to attend, but I wasn't expecting so many. Thank you Tammy! It's good to have good friends! Not only did Tammy send me a boxful of lovely books, but she also included a very cool tote bag, an Ally Condie sampler, and some great swag! The magnet is already front and center on my fridge, proclaiming to all that Authors Are My Rock Stars! Thank you so very, very much!!! That was very nice of Tammy to send you over ARCs from BEA. I hope you like em all. It's good to have thoughtful kind friends. Friends who love books as much as you do are priceless! It is strange that you would get a Uline catalog but I will confess to having a small obsession with office supplies. Nice haul! I'm really curious about Jackaby! Winner of the Summer in the City Kit!